Sweet, hot and tender. The three bean is a perfect flavour foil. It’s kind of funny to be writing posts with summer in mind. When I made these ribs it was most un-summery here in Nova Scotia. But I want to give you (and me) options for when the weather actually does turn warm. That’s why I posted an excellent (a few of my co-workers’ description) three bean salad on April 27. It’s a staple for backyard gatherings. So is barbecued ribs. That’s my rationale for this post, plus the fact I had a bit of a craving. Sometimes I get a yen for Jack Daniels®. Not by the glassful, but just a taste. 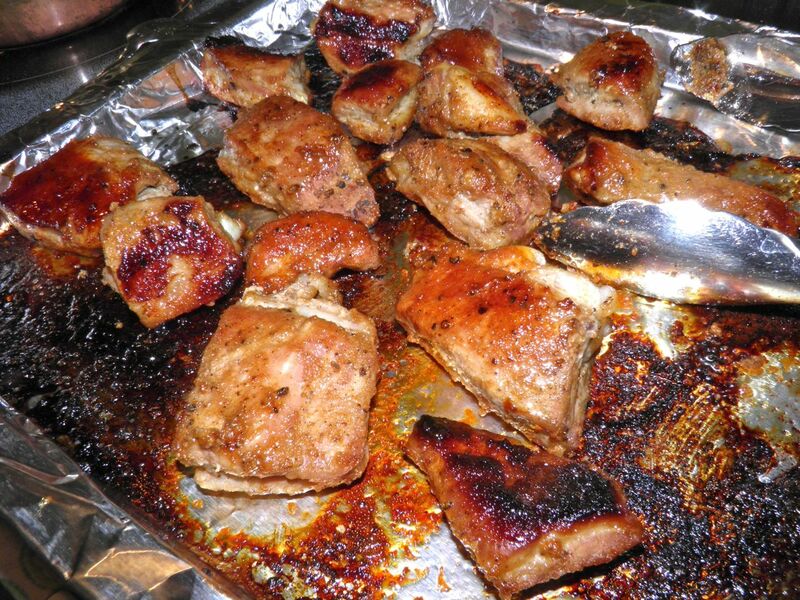 A good way to enjoy it (without possibility of a headache) is to use it in a barbecue sauce. It’s as though the stuff was made for it. In case you’re not familiar with it, Jack Daniel's is a sour mash Tennessee whiskey that is reputed to be the best selling whiskey in the world. It has been produced in Lynchburg, Tennessee since 1875. 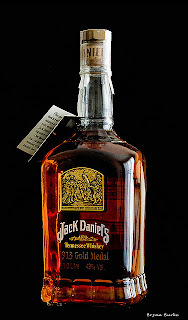 Although it has all the production hallmarks of a classic bourbon, Jack Daniel's goes one more step, filtering the whiskey through sugar maple charcoal prior to aging. That extra step gives it a unique, sweet taste. It’s perfect for barbecue sauces, as well as by the glass if you like. I posted a recipe for a JD barbecue sauce last year, but of course I can never leave well enough alone. So here’s another one. It’s not a classic sticky sauce, but more of a glaze I suppose. I do know that whatever it may be it’s very tasty. I combined the JD with honey and my own “smokin’ grill rub.” (HERE) If you make the hotter version it imparts a bit of a take-no-prisoners heat to the end product. Marinating the ribs in the "sauce” turned out to be a stroke of genius. Not only did it let the alcohol tenderize the meat, but some of the JD flavour also permeated inside. Let marinate for 2 hours to tenderize. Since the weather outside was frightful (and inside was so delightful…) I opted for baking the ribs. Baking took 50 minutes, which was just right, even for pieces as thin as ribs. They were still tender and juicy. Just make sure your ribs have some fat on them. This recipe is a classic combination – sweet and heat. This glaze would be excellent on beef ribs as well. Maybe even better, not to denigrate this pork variety. It’s you choice. If using an outdoor grill, I would suggest cooking the ribs with the lid closed over medium or indirect heat. This slow(er) cooking method lets the sauce caramelize on the ribs as you turn and baste. You should all try these. They’re among the best ribs I’ve had in quite a while. The foil makes clean-up happen in 5 seconds. Combine all ingredients except for the ribs in a small dish and mix well. 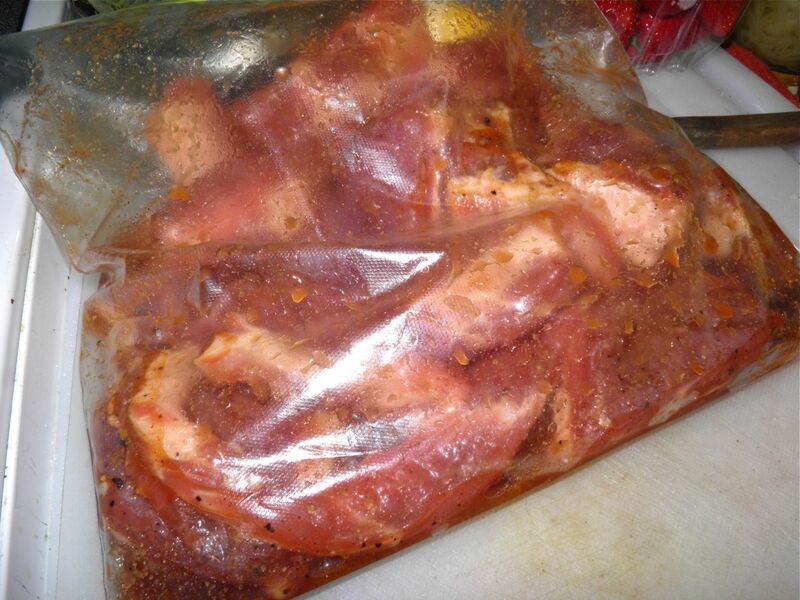 Place the pork ribs in a sealable bag. Pour the marinade over the ribs in the bag, seal and shake well to coat. Let the meat marinade for 2 hours on the counter. Reduce the marinade to a sauce and brush over the ribs. Bake the ribs in the oven for 50-60 minutes. Turn and baste every 15 minutes. You can also use the juice that has collected on the foil to help them brown. 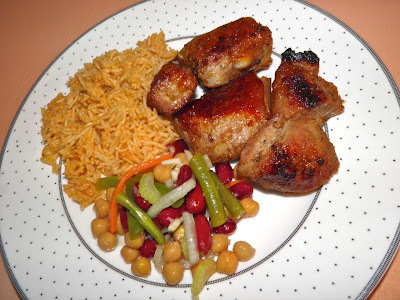 Serve with dirty rice or potato salad, and three bean salad (recipe HERE). * I used pork breast bones instead of actual ribs. They have a lot of meat and just enough fat to keep the meat tender during cooking.